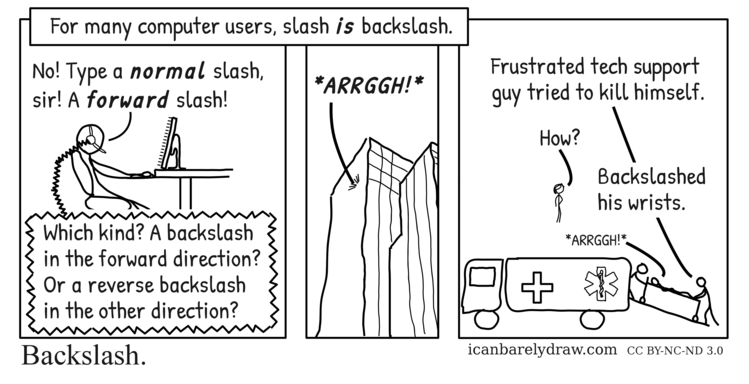 Narrator: For many computer users, slash is backslash. A man wearing a headset is sitting at a computer display. Man: No! Type a normal slash, sir! A forward slash! Voice from headset: Which kind? A backslash in the forward direction? Or a reverse backslash in the other direction? The exterior of a tall building is seen. Man 1 and man 2 are pushing a medical cart up a ramp into an ambulance. Man 3 lies on the cart. A woman is standing in the background. Man 1: Frustrated tech support guy tried to kill himself. Man 1: Backslashed his wrists.